This layout was designed to provide a condensed snapshot of the iron making stages of a large integrated steel plant somewhere in the north eastern United States. 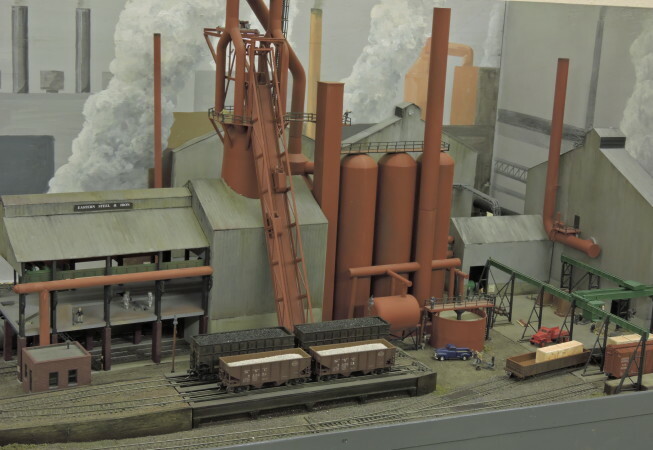 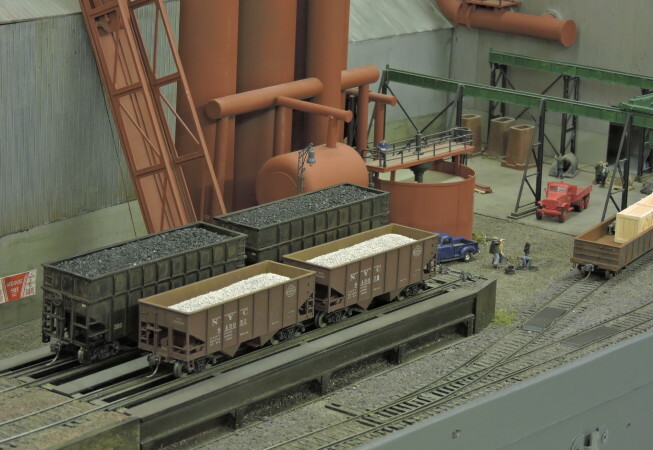 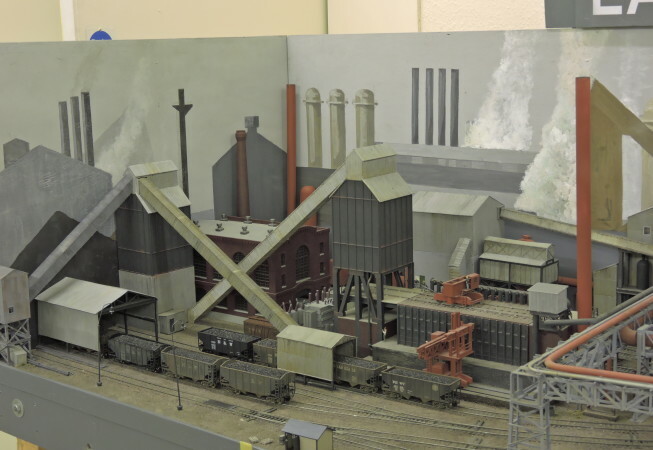 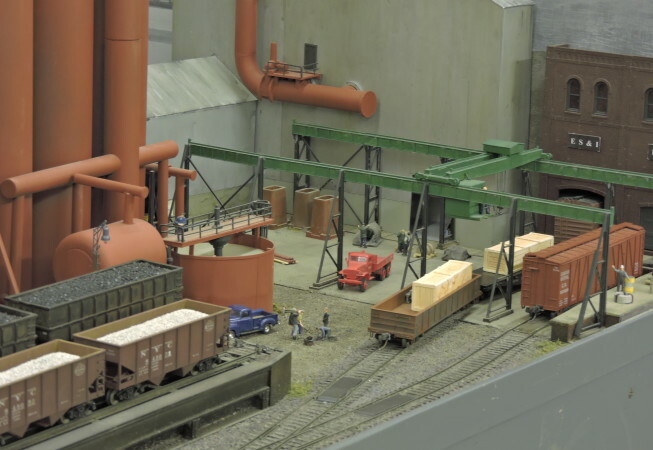 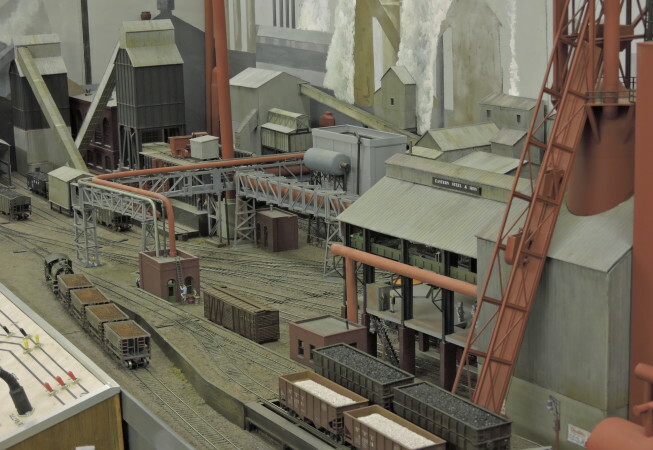 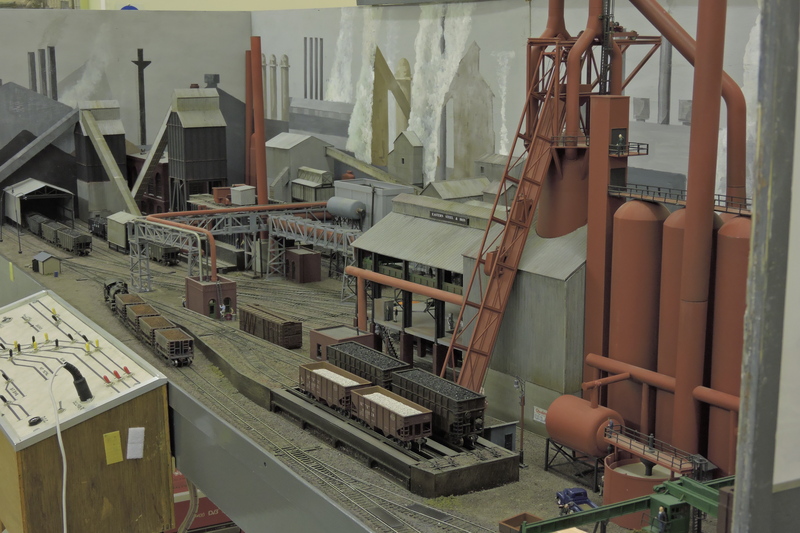 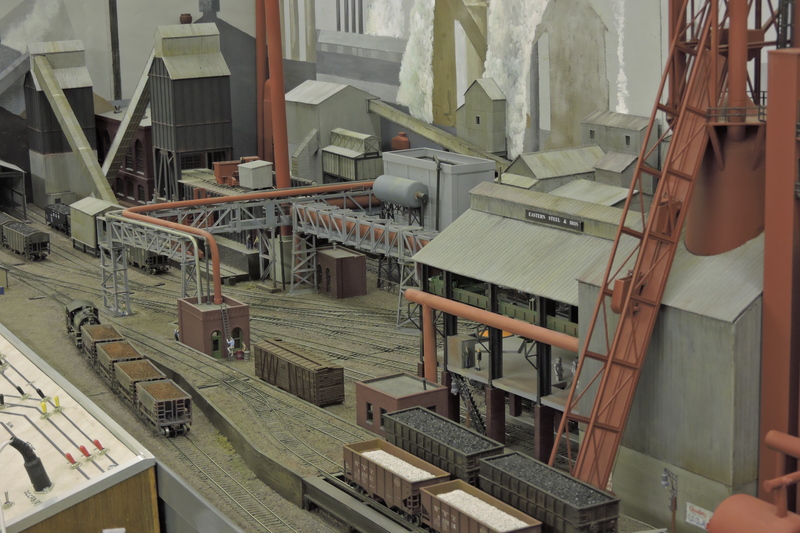 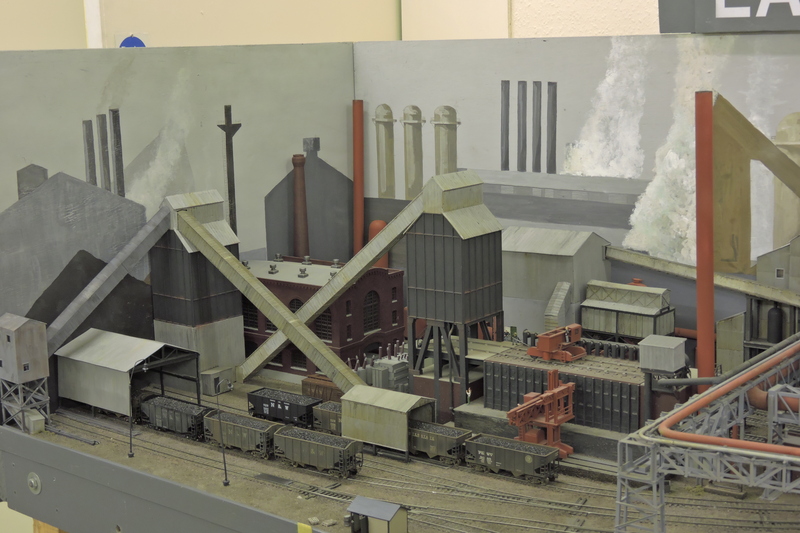 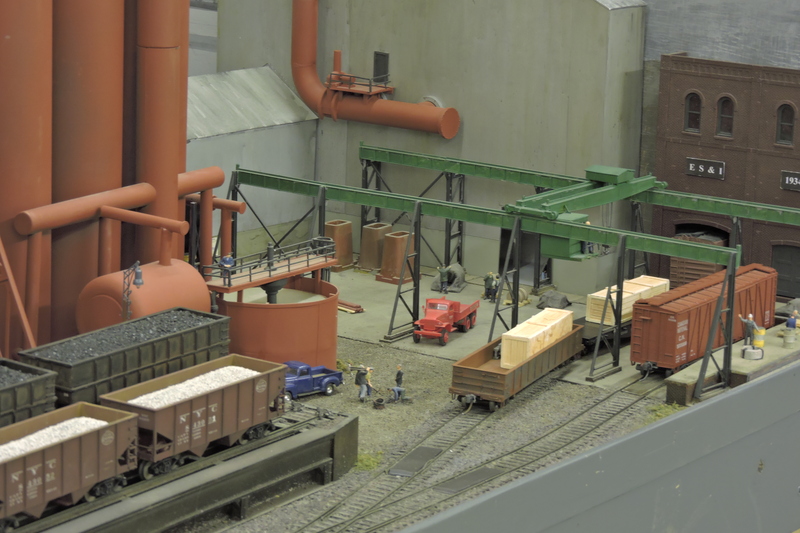 It was conceived out of a desire to do “something different” and the Walthers blast furnace and coke oven kits offered the ideal opportunity. 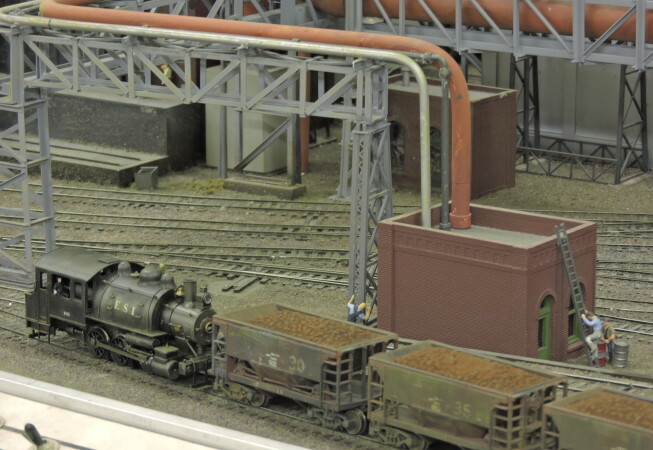 Along with this was a self-imposed challenge of attempting to keep the size down to two 4ft long boards in order to minimise potential problems relating to transport, handling and storage. 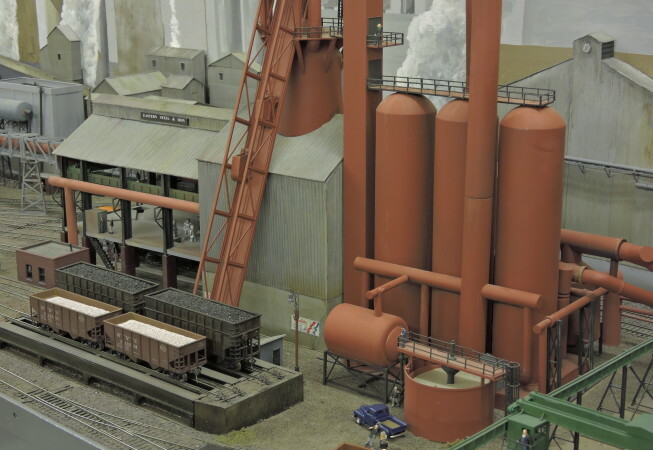 Apart from the blast furnace and coking plant the other facilities consist of power plant, coke load-out, ore grading and sintering, coal tar by-products, engineering shop and large low relief buildings hinting at the subsequent open hearth steel plant and rolling mills. 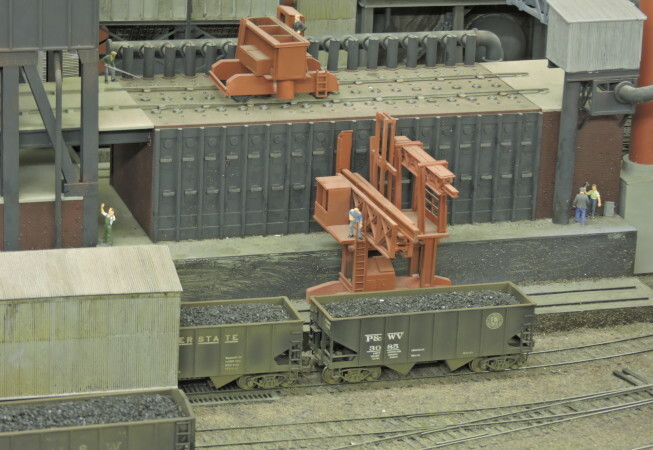 Our chosen time period is set in the 1950’s/60’s when rail traffic dominated. 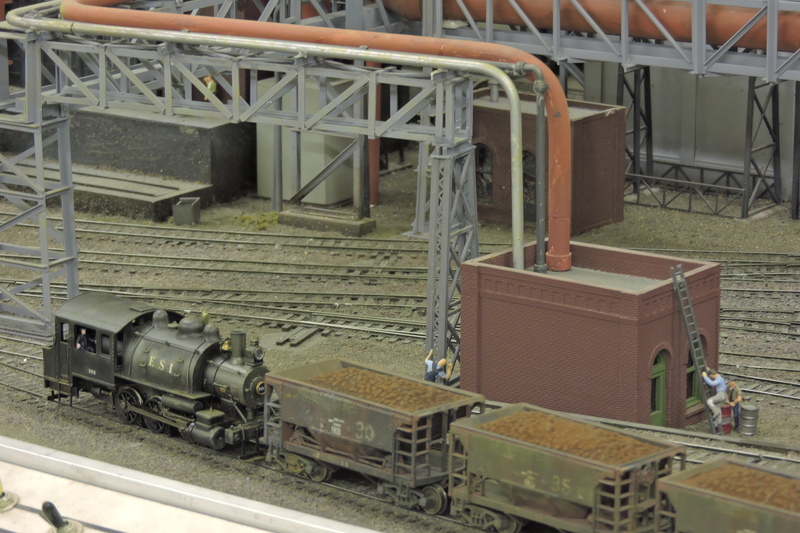 If it was big and heavy then it ran on rails. 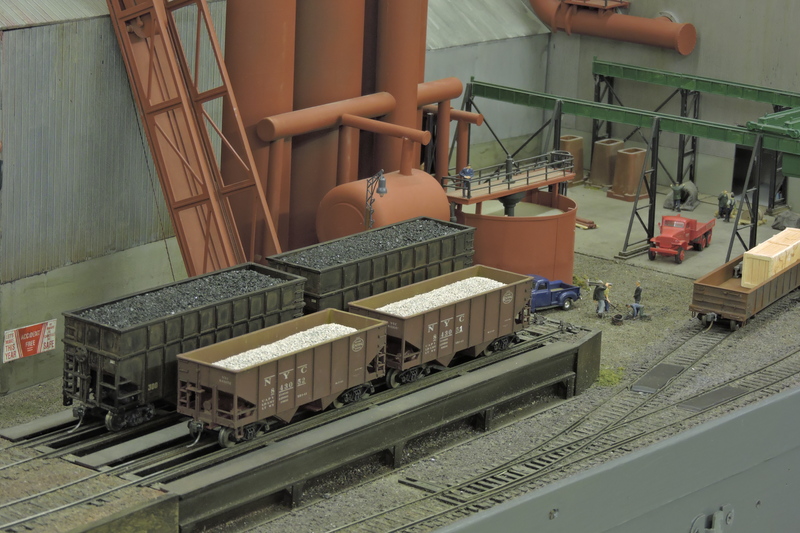 In this setting coal is brought in from West Virginia and iron ore from Lake Superior by “lakers” and rail. All the remaining traffic is internal with diesel switchers moving coke, sintered ore, scrap, hot metal, slag, blast furnace dust, coal tar products and of course various engineering spares and supplies. 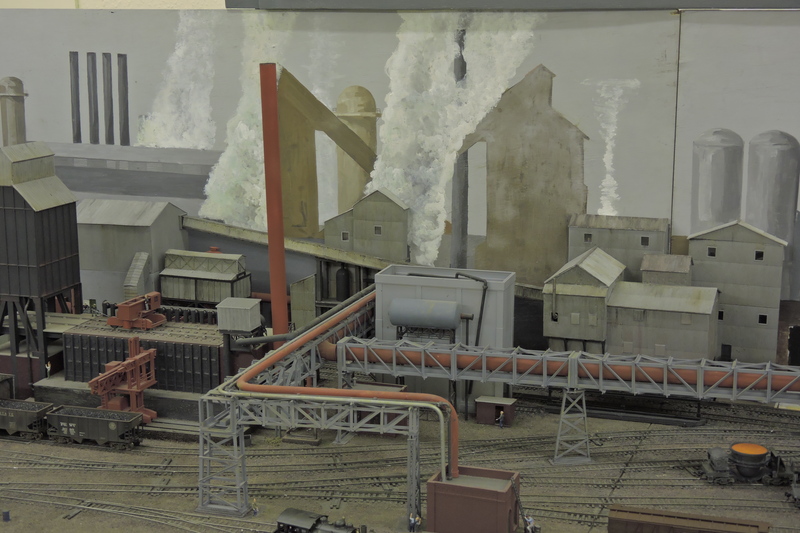 The visitor is invited to imagine the remainder of this presentation, namely a heavy overcast layer of industrial smog. 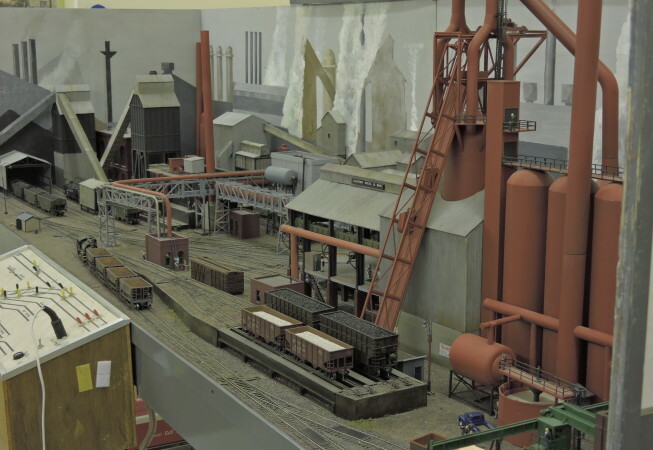 Design and construction was undertaken by “The Pittsburgh Modellers”, a six strong group of North American modellers located in Fife, Central Scotland and the Kirkintilloch Model Railway Club.